He's never won a major live poker tournament. He's second to last in chips to start the final table. He's too quiet to become the leading poker ambassador. 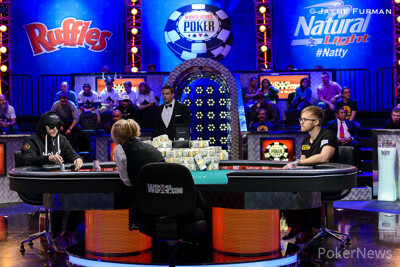 Those were all rumblings heard throughout the poker world about Martin Jacobson in the months leading up to the 2014 World Series of Poker Main Event final table. 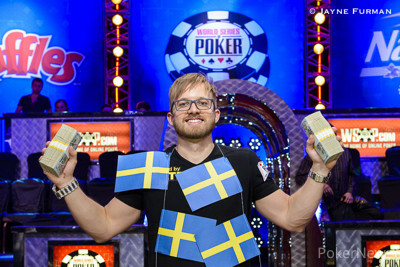 When it was all said and done, though, the man from Sweden proved to be the last player standing, topping poker's greatest event to win his first WSOP gold bracelet and the massive $10 million first-place prize. After Monday's return of the November Nine, Jacobson was one of three players remaining along with fellow Europeans Jorryt van Hoof and Felix Stephensen. As fate would have it, van Hoof's chip lead wouldn't last, and the Dutchman would soon fall to the smallest stack of the three. The trio battled for 49 hands before van Hoof was sent to the rail in third place. On Hand #293 of the final table — the 49th hand of Tuesday — van Hoof opened and then four-bet shoved with the after Jacobson had three-bet him. Jacobson snap-called with the , and van Hoof was in a world of hurt. The board ran out , and van Hoof was off to collect his payday of more than $3.8 million. 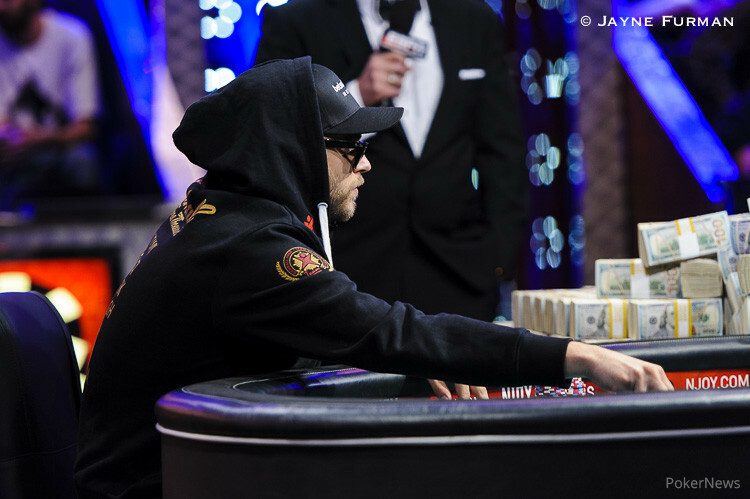 At the start of heads-up play, Jacobson had 142 million to Stephensen's 58.5 million. The Swede had the chip lead, he had the momentum, and he had the skills, and it seemed as though nothing was going to stop him. It proved true as he kept the pressure on his Norwegian opponent to grind Stephensen down to under 30 million in chips. Interestingly, Stephensen seemed to be winning most of the pots heads up to start, but all of the big, meaningful ones went to Jacobson. Then, on Hand #328, all of the money went in for the final time. Stephensen opened with a raise from the button, Jacobson moved all in, and Stephensen called with the . While a medium suited ace isn't a bad hand to go with when in the position Stephensen was in, Jacobson had a powerhouse with the . The flop delivered Jacobson with top set of tens and really gave him a stranglehold on the hand. The turn was the to leave Stephensen drawing dead. Jacobson's supporters began to rush the stage as the dealer completed the board with the to make it official. With that, Martin Jacobson was crowned the champion of the world's greatest poker event — he secured his first major live poker tournament victory, and it proved to be the biggest and baddest of them all. 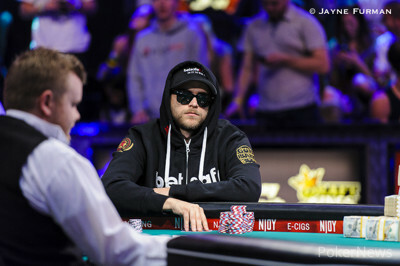 Since Joe Cada in 2009, no player had gone from beginning chip leader of the event to champion, but Jacobson did so after finishing on top of the counts way back on Day 1a. Congratulations to Jacobson on winning the 2014 WSOP Main Event and cementing himself in the poker history books! Felix Stephensen opened his button to 3.5 million and Martin Jacobson moved all in for over 170 million with Stephensen making the call for his final 28.3 million. With Stephensen at the disadvantage, each player's rail took to their feet and began chanting excessively. "Ten for ten! Ten for ten!" shouted Jacobson's rail. "Ace! Ace! Ace! "responded Stephensen's rail. The dealer was given the go ahead to spread the flop, and on command she flipped over the flop to give Jacobson the overwhelming stranglehold on the hand. Pausing for a few moments to let the anticipation build, the dealer would burn and turn the on the turn to render Stephensen drawing dead as the completed the board on the river. As soon as that final card was dropped, Jacobson's rail - that included family, friends and poker players Jason Koon, Mark Radoja, JC Alvarado, Connor Drinan, Marc-Andre Ladouceur and Mohsin Charania (to name a few) - rushed the stage to congratulate the Swede as they cheered, hugged and messed up that near-perfect hair as he was now the 2014 World Series of Poker Main Event Champion! For Stephensen, his rail didn't disappoint at any stage of the tournament and continued to chant "Felix! Felix! Felix!" as a dejected Stephensen shook Jacobson's hand and headed to the rail to be consoled by his rail. That consoling will have a $5,145,968 payday to go along with it to make him feel a little happier. Seminole Hard Rock "Rock 'N' Roll Poker Open" (RRPO) returns to Seminole Hard Rock Hotel & Casino in Hollywood, Florida, Nov. 13 through Dec. 3, 2014 held in the resort’s ballrooms. The series will feature 20 main events along with several secondary events and qualifiers. The exciting live poker action culminates with the live-streamed and televised $2 Million Guaranteed RRPO Championship from Nov. 28 through Dec. 3. The RRPO schedule can be found at www.SHRPO.com. From Dec. 1-3, 2014, Poker Night in America, a new, nationally-televised, poker-themed reality show, will film high-stakes gaming action during the final week of the series. Two cash games and the RRPO $2 $2 Million Guaranteed Championship final table will be aired on CBS Sports Network over eight episodes in Spring 2015. The broadcast schedule will be released at a later date. In addition, the Championship final table will be live streamed on PokerNight.com and SHRPO.com. The Championship will feature a $2 million guaranteed prize pool, with 30,000 in tournament chips and two starting flights on Friday, Nov. 28. 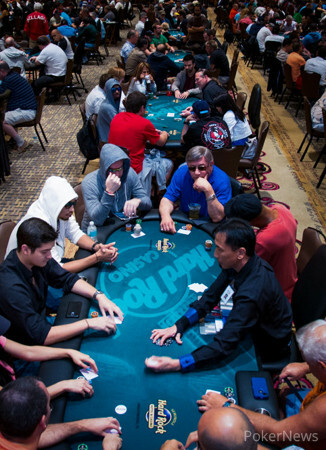 Players may play either starting flight, or both, if they are eliminated on Day 1a. Reentry will be allowed until the start of Level 7. The annual series kicks off on Thursday, Nov. 13 with a $350 buy-in Deep-Stack No-Limit Hold'em event featuring a $500,000 guaranteed prize pool, in addition to a variety of tournaments including a $1,000 buy-in Six-Max No-Limit Hold’em with a $75,000 guarantee, a $1,650 Purple-Chip Bounty No-Limit Hold’em, and a $570 buy-in No-Limit Hold’em with a $500,000 guarantee. Satellite events for the Seminole Hard Rock "Rock 'N' Roll Poker Open" Championship will be held at the Seminole Hard Rock Hollywood starting Oct. 2014. Enter to win a seat in to the $2 Million Seminole Hard Rock "Rock 'N' Roll Poker Open" Championship. Visit www.SHRPO.com/WinASeat, and www.SHRPO.com. Martin Jacobson had the button, and raised to 3.5 million. Felix Stephensen moved all in for 24.6 million, and Jacobson folded. Felix Stephensen deliberated for close to 30 seconds before announcing he was all in. Martin Jacobson checked his holecards and then tossed them to the muck. Martin Jacobson had the button, and he raised to 3.5 million to win the pot. Felix Stephensen opened the button to 3.5 million and Martin Jacobson moved all in for over 170 million with Stephensen quickly folding.